1. Heat 2tbsp of butter or ghee in a pan and fry the paneer/tofu cubes until golden brown. Drain and set aside. 2. In the same pan, add 1 more tbsp oil and fry the onions until golden brown. 3. Add the ginger garlic paste and fry for a minute. 4. Next, add the corriander powder, garam masala, chilly powder and some salt. Fry for few minutes. 5. To this, add the tomato ketchup and methi. Mix well and add the milk. 6. Lower fire and cook covered for 5 mins. 7. Open lid, add the fried paneer/tofu and the cream. Mix well and simmer for 3-4 mins. 8. Garnish with fresh coriander leaves . Serve warm with Chappatis or pulav. Tip : If paneer is fresh one no need to fry it...otherwise better fry it with little butter or ghee. hi chechy...welcome bak...paneer butter looks delicious. Divya thanks and try it dear..njan guarantee! Chithra, very good recipe. Will def try it out. I am so glad you are at it again. 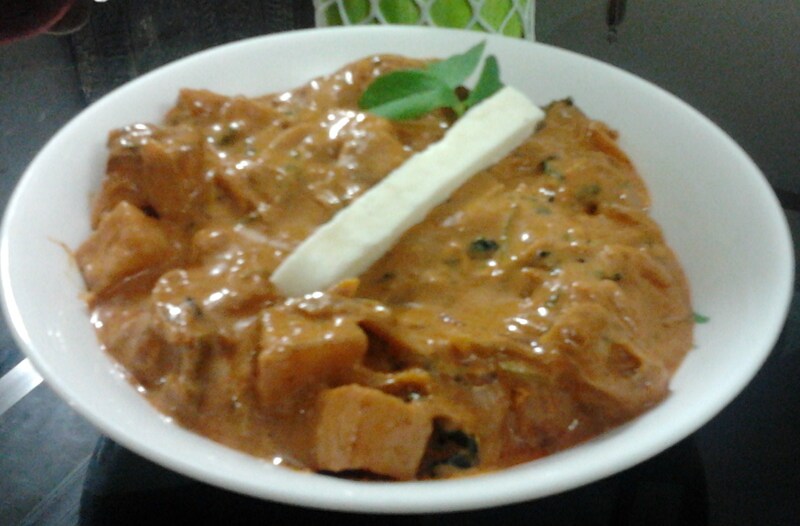 paneer butter masala looks creamy and delicious!! thanks dear for the motivating comments! !